I never thought I am going to deeply study about a country called Korea. I knew කොරියා in Sinhala is used as a similar word to slum houses. But I never thought that such slim housed nation became a developed nation and there is an interesting story to unearth. I used to say dictatorship is better than Senate system, but I never knew the founding father of a nation controlled the state with such an iron fist and usher it to development. I talked about Family Tree, but I never knew families can be lead to win the world market. I often said FDIs are not the secret behind economic success but I never knew good examples than China and Japan. I ve seen our loving cricketers of West Indies and SL dance Gangam Style but I never knew kpop to be so profitable export like Bob Marley to Jamaica. I ve seen Sujatha Diyani capture SL than Hindi tele dramas. But I never knew South Koreans export literature to a massive extent. Samsung is a Korean phone but I never knew they started as dry-fish seller. I knew Warren Buffet as a long term investor and I knew World Bank, IMF as a collection of paid economists who have no loyalty towards one country's development but I never knew Berkshire Hathaway purchased a substantial chunk of POSCO which world bank once branded as useless effort. A video clip which summarizes South Korean Success..
As I have heard, North Korea has a stronger dictatorship. Does it mean they are better than south? South Korea had a dictator General Park Chun Hee and North Korea had a dictator Kim Il Sung. So the two variables were equal. One allowed private enterprises and the other prohibited private enterprises. So the decisive factor was not dictatorship but private enterprise between North and South Korea. Even now this is how debates take place in South Korean parliament. We at SL enjoy super class democracy and even the strongest leaders leave peacefully even before the final results released. Ranil Wickramasinghe once left Temple trees carrying a framed poem IF in his hand. MR left Temple temple trees very peacefully. Koreans have elected one time dictator Park's daughter to govern them now. Ok. Lets forget about democracy for the moment and look at good lessons from South Korea and explore their voyage from under developed nation to developed nation. This is the most important think to discuss / ponder than anything else. South Korea was one of the poorest nation of the world when General Park Chan Hee captured power and created a military style government. South Korea was supported by US and North by Russia. But because of anti-democratic actions of General Park , Americans gave up supporting South Korea. General Park moved towards Germany. West Germany understood the fate of South as theirs. Its the same story . The same country torn apart made East West, or North South and one to follow communism and the other to capitalism. West Germany offered jobs for South Koreans. Remittances from South Korean Nurses and miners working in Germany was the main source of income of this poor country. Sri Lanka followed the same style under JRJ. Started sending house-maids and drivers to Arab and continue upto now. Same strategy and two different results. Yes the reason is that we ate those hard earned foreign currency than reinvesting them in money earning / employment creation local industries. It is still the same and it will stay the same for a foreseeable future too. Because, people we send to lead us have no vision. They had dictators with vision. Our dictators had one thing only in their mind. Sri Lanka followed the same style under JRJ. Started sending house-maids and drivers to Arab and continue up to now. How long are we going to be a developing country? 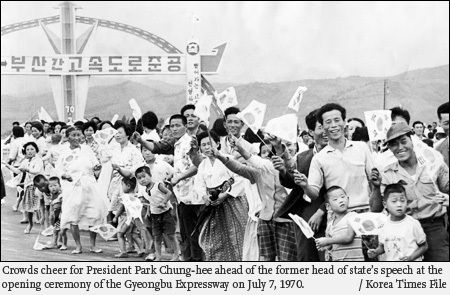 By putting the future remittance into a collateral General Park Chun Hee started investing in Seoul-Busan Highway and Now Korea Celebrate 40 years of High Way. 40 Years ago spending massively on highways in a country where people don't have vehicles? Yes that is the path of Success.. Please read following link very carefully. It talks about Sri Lankan Highways. It talks about How World Bankd refused giving a loan to South Korea for developing the highway. Read the same criticism you get for SL spending heavily in infrastructure. If Korea had democracy during first five year plans definitely people would have sent Park Chun Hee and US Kennedy and World Bank would have celebrated the freedom people get over un-necessary development of infrastructure when people have other priorities..
Once there was an attempt to assassinate Park. A gunman shot at Park who was delivering a speech. Target missed. Park's wife got severely wounded. Anyone who wants to master finger style guitar just keep this ten year Korean Boy as a role model. Do you want a Dictator or an elected person to lead us? So what does an elected leader do? He has a short term given like 6 years...He is held responsible for any mistakes.. So what will he do ? I appreciate a dictator who can appear as an elected democratic to the rest of the world ( to prevent sanctions) who will rule for more than 18 years consecutively,.. appears to closely align to US policies but never follow... who gets the advice from IMF and WB but never practice....who understand the power of Monopoly in business and allow private business but control them through State Banks...etc..
What is wrong with their advice? (who gets the advice from IMF and WB but never practice). When we slowly study Korea we will come to know about them... Of course IMF bailed out Korea and in return Korea became so strong in foreign reserve holding.. Someone told (from WB) me that we spend 70% of the borrowed money on recurrent expenditure and how do we expect to develop then? How much of the 30% gets siphoned of is everyone's guess and is it WB (or for that matter IMF) fault?. yellow knife wrote: When we slowly study Korea we will come to know about them... Of course IMF bailed out Korea and in return Korea became so strong in foreign reserve holding.. If I am not mistaken Why Nations Fail talk about your issue..